By guest writer | October 4, 2018 | This post may contain affiliate links, which means we may receive a small commission, at no cost to you, if you make a purchase through a link. Read our Disclosure. “The best things in life are free.” But for a small cost you can get some unreal life experiences! So how do these families manage to make it all over the world? Are we travelling with lotto money? Are we mobsters? Perhaps you think we made a best-selling App? We have no claim to fame, nor do we have any glamorous sort of income. But we can tell you that for 4 people (2 adults and 2 kids) in August 2012 we managed to get to Boracay, Asia’s Best Beach for under $30. I’m sure you are still reading, cause you want to know how, right? It all started when we had booked 3 weeks in Manila, Philippines. The Philippines is in the western Pacific Ocean and Manila is known as the most densely populated city in the world. Granted, with the mass of population and the peak hour traffic running 24 hours non-stop, 3 weeks in Manila was too long. We needed to hit up a beach or island getaway. I have endless emails from airlines offering discounts. Some end up straight in the trash, some I review thoroughly. So during another rainy, chaotic day when the weather left us no choice but to spend another day at home, a Tiger Airways marketing email came through and seemed to be the one shining ray of sunshine in otherwise flooded Manila. “1 peso flights to Boracay” it advertised. Having no idea what Boracay was or where I did some quick research to find it was definitely a place we had to visit. I can’t believe it had never made it to our travel bucket list earlier. Recently voted, on Tripadvisor.com’s 2012 Travellers Choice, as Top Beach in Asia and 2nd best beach in the world, Boracay is a small island off the Philippines. 1 peso equates to less than 2 Australian cents. How could anyone resist such a deal? I immediately looked up flights on a Saturday and found only one flight left at the advertised sale. For Sunday, the very next day! There are two airports near Boracay. 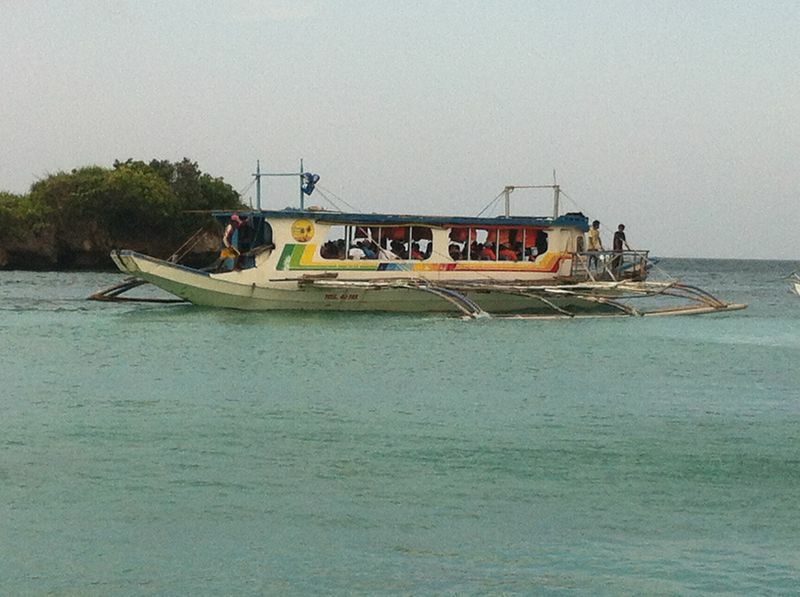 One is Caticlan, merely a boat ride away, but our flight was landing in Kalibo, a 1.5/2 hour bus trip away from the boat ride. We decided to keep up our spontaneity and just figure it out when we got there. Our flight was at 6:15pm. When we stepped on board, the last family which we always aim to be, I swear you could of heard a pin drop. It was empty. There were perhaps 6 rows of people. Granted this would have made for a very pleasant hour flight if there hadn’t been so much turbulence from the alarming storm outside. But we did land safely and on the ground there was no rain. At Kalibo we simply stepped outside the very small airport and there were plenty of staff there loading up buses as the flights come in. We didn’t have to do much work to find our way on a jam-packed bus towards Caticlan. The driver must have been in a hurry cause the tyres loudly protested his refrained brake use around corners and we were at the boat port in minimal time. While the bus fare included the boat fare there was still some environmental fees to be paid before boarding the long boat. The boat doesn’t leave until every seat is filled or every bus that left the airport arrives, so there was a slight wait. It is also important to note that a travel backpack might be better for this travel as the jetty to the boat is swaying and not easily passaged with 3 roll on suitcases (the small carry on kind) and 2 sleepy toddlers. You can get a porter for fairly cheap; just make sure you have small change. By now it was more than dark. The journey across the black ocean was less than 10 minutes and included a free, exciting lightening display courtesy of Mother Nature. At Boracay’s dock porter’s and tricycle drivers quickly inundated us. Motorized tricycles are a common means of passenger transport everywhere in the Philippines. Motor-tricycles are built around a motorcycle and can accommodate three to four passengers (although I’ve seen more) with luggage placed on the roof. Caius and Josh sat next to the driver and Mia, I and our bags were seated on two bench seats in a compartment behind the rider and front seat. The journey was exciting and thrilling with my 3-year-old daughter smiling from ear to ear, despite the lateness. Our hotel was located on a strip called The White Beach. We couldn’t see much that night and all stumbled into bed, but the views the following day accurately portrayed the beaches name. We had completed our first epic adventure, as a family, to get to a remote tropical island and we had done it under $30. Our hotel was on the beach. Literally 5 steps from it. Boracay may only be 4.5 miles long, but it has the best beaches in Asia. Pure white powdered sand, crystal clear blue water and swaying palm trees. 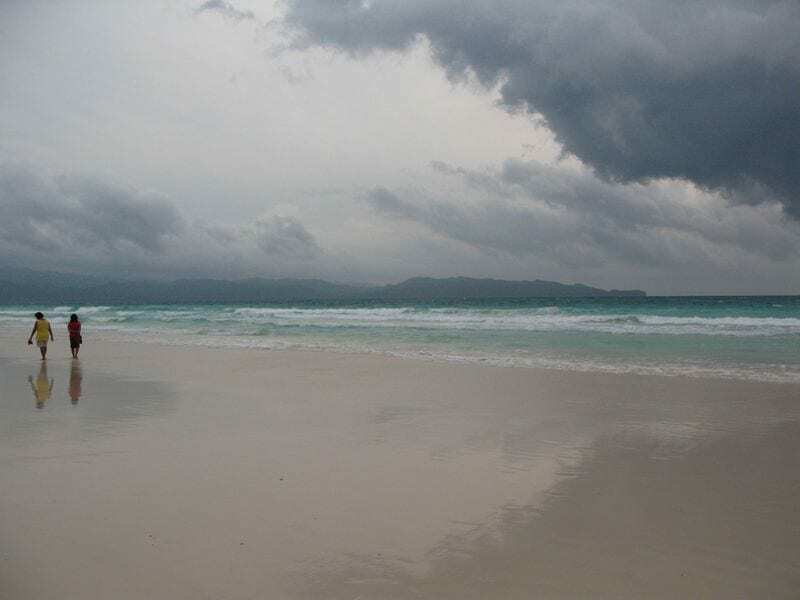 Once you have arrived on Boracay there is plenty to fill your time with. From lazy days snoozing on the sand, making sandcastles, swimming in magnificent sapphire water, collecting shells to water sports including jet skis, boat rides, snorkelling, windsurfing, cliff diving, etc. 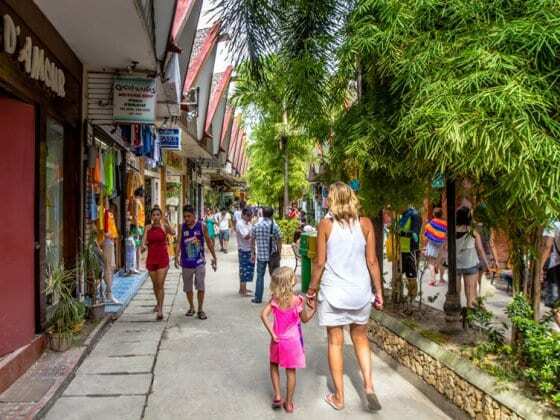 There is a small outdoor shopping mall and restaurants, massage places, and clubs that line the beach all ready to complete your relaxation therapy. 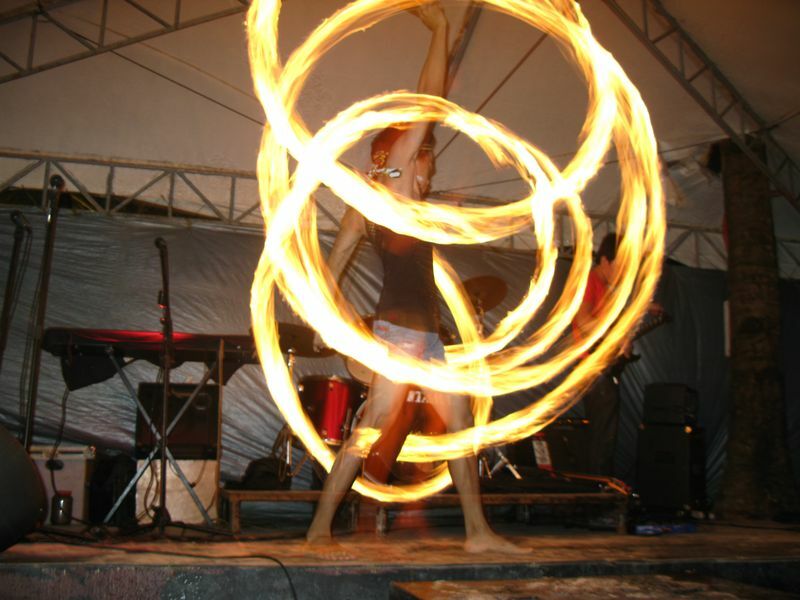 These restaurants range in any cuisine imaginable and really turn up the heat in the evening with cross-dressed fire-dancing entertainment. In addition to this, there is a golf course and an excess of 350 beach resorts offering more than 2,000 rooms ranging from high-quality 5-star resorts to easy-going budget accommodation. We decided to forego the caves & island hopping for a more relaxed approach, eating, playing, swimming, eating, massage, sleeping, eating. All of life’s finest activities on one small island for a negligible price. If you are looking for an island escape with minimal cost, I suggest taking a look at Boracay, Philippines. It’s one of those holidays that will leave you wanting more. Have you been to Boracay, Philippines before? Or have you ever nabbed a sweet travel deal like this one before? We rented our house and our dog, packed only 3 suitcases and now this family of four are traveling the world. Leaving our Australian home in May 2012, with a 2 year old & a 3 year old, we determined to make a lifestyle change beneficial for our family. It’s an open-ended, unplanned round the world trip discovering amazing places for toddlers (& we have fun along the way) that you can share by visiting our family travel blog or Facebook page. We look forward to bumping into you around the world. Great post! Can’t believe it was so cheap to get there! I’ve heard mixed things about Boracay. I guess people either love it or they hate it. If the Benders love it, I’m sure we would too. They’re a family after our own hearts! What a fun adventure! We were in Boracay a few years ago – it’s a beautiful place – the kite surfers are really amazing to watch on Bulabog Beach. So inspiring to see such a fun family traveling together! @Micki – Thanks Micki. We were there in the low season, hence the storm clouds in the picture, but it was quiet and still hot. 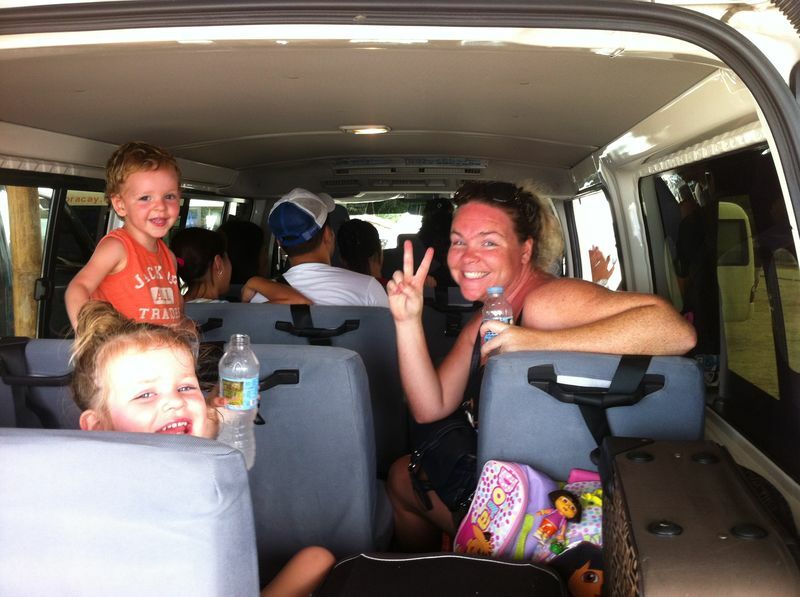 Family travel is great, we love visiting the world with our kids. Such a great story! An adventure like this always seems so much more exciting when it costs next to nothing! 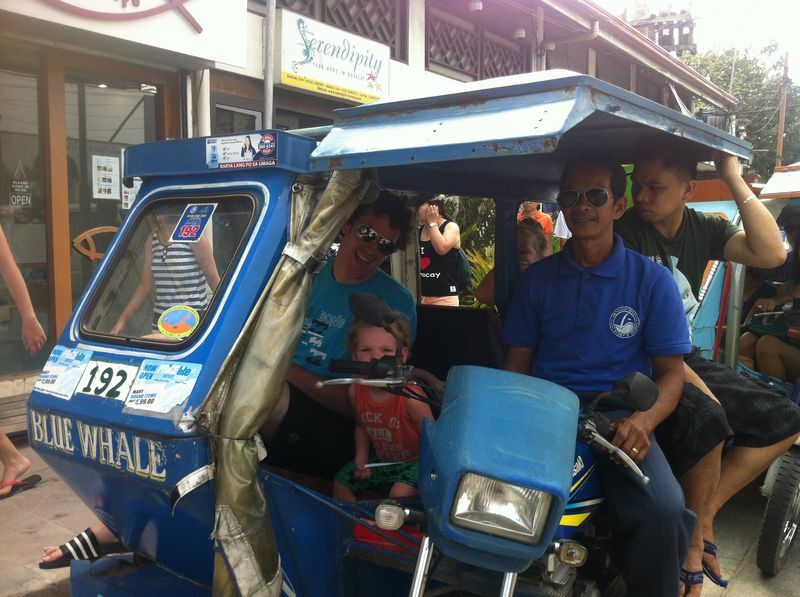 Kieu – I wish we could have stayed on Boracay for a lot longer then 3 days, it was so beautiful. I hope you visit! Whatta sweet deal! Even some of my fellow Pinoys have not scored such deal. I reckon it was lean season? Hi Ciaraysabel. Erin did ask me to change that spelling but I was out cruising and then I forgot to come and edit it. Sorry about that and sorry to Erin for being a little slack and flighty! @Gaye – It was low season with less than 10 people on the flight. It rained, maybe once a day, but it was still warm and beautiful. We enjoyed the low season, I hear it gets crazy come the high season?! @Ciaraysabel – My bad on the spelling. I checked several sources for the right spelling and still got it wrong. Thanks for the correction. Good luck with finding your cheap flight! Oh no problem at all Caz. 🙂 Was just thinking it might confuse some people. Hehe.. By the way, I really enjoy your blog..thanks! 🙂 GOD bless! You’re very much welcome Erin! 🙂 And yeah..I really do hope I’d catch those really cheap flights..one of these days! Haha..
We so want to come back and do them. I heard Palawan is amazing, but hard to get too? I have never been to a real, beautiful beach. The beaches I have been to are either manmade or really rocky. It would be great to go to a beach like this at some point. Where are you? Beaches are our favourite, we love discovering them all. Boracay is the world’s best islands. Paradise indeed..
It’s not anymore according to Travel + Leisure. It’s only the 2nd best. 🙂 Palawan they said is the new #1. Where you can find El Nido and Amanpulo. But I have to agree Boracay is definitely a paradise. That was so cheap! Did you try some water sports? kite boarding is fun as well. Try it next time. Thanks Richard we have done loads of water sports in Bali, but not Philippines – will do! I am glad that you enjoyed your stay in the Philippines, specifically in Boracay. Truth to be said, Manila is not the whole Philippines. Its an archipelago of thousand islands–each waiting to be discovered as a hidden paradise. I am from Samar Island, Philippines. I hope you get to visit too this gem in the eastern part of the Philippines. Cebu, Palawan, Dumaguete, Bacolod, and the different parts of Mindanao also offers exciting escape. Up north, you have Sagada, Mountain Province and Baguio which will offer you a delightful view of the mountains. Banaue Rice Terraces is also worth to see.